Valentine’s Day is here – so exciting! 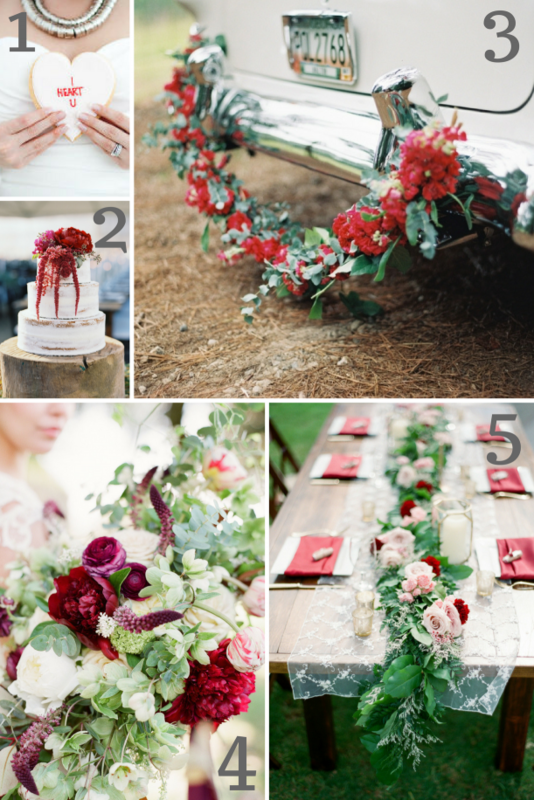 If you are seeing all things red, then you are sure to enjoy our red wedding inspiration board. One thing I love about the color is that it fits for so many themes and holidays – Valentine’s Day, Christmas, 4th of July (any military, actually!) and other times. It’s a bright hue, but it’s one of my favorites. So whether you are planning a celebration in winter or summer, here are a few lovely ideas I found! I’m always a sucker for cookies – especially when they can do double duty in sending a message to your sweetie. So cute! Photo by Elizabeth in Love. This barely iced cake is the perfect red wedding inspiration with drippy red flowers. Gorgeous! Photo by Mariel Hannah Photography. Ok, this idea is just too cute! I truly haven’t seen many (or any?) getaway cars with flowers on the back. Cans, streamers and the like, yes… but I totally adore this amazingly classy way of decorating the escape vehicle. Photo by Laura Gordon Photography with florals by Lindsay Coletta. Red flowers are so pretty – especially when interspersed with white. With peonies and striped tulips, there is a great variety of red out there when it comes to florals. Photo by Sophie Epton Photography with florals by Isa Events. Adding a line of low blooms adds interest to a table – especially when paired with romantic, modern lace and red napkins for impact. Photo by Aria Studios with florals by Passion Roots. I hope you enjoyed today’s red wedding inspiration, and join us next Tuesday for another themed roundup of ideas for your own day.